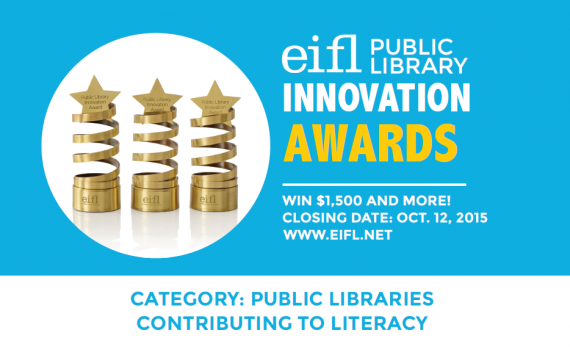 EIFL (Electronic Information for Libraries – www.eifl.net) is calling for applications for a new EIFL Public Library Innovation Award – for public library services contributing to literacy. The call is open to public and community libraries in developing and transition countries that use information and communication technology (ICT) in creative ways to improve literacy of children or adults. The deadline for submitting applications is 12 October 2015. There will be more than one award – so please share this information and help us attract applications from as many innovative public libraries as possible. This is the first phrase of the report “The power of Reading: How the next government can unlock every child’s potential through reading”, in which the campaign Read On. Get On is based. A text aiming to raise awareness in the next Government about the importance of closing the reading gap in English society. ALA has presented their “America’s Libraries Report 2015”, where they identify library trends of the past year in academic, public and school libraries. This year, they highlight the growth of digital literacy projects, as well as the proliferation of makerspaces. Also, they reportthe identification of libraries as “change agents addressing unique needs and identifying trends that impact the community”. Next 7 May 2015 NAPLE General Assembly will take place in Riga, Latvia. As in the last few years, we’ll be celebrating it in the framework of the EBLIDA-NAPLE Conference, under the title “Building a Europe of Readers’”. The day before, 6 May the NAPLE E-Book Working Group will be celebrating a meeting. We’ll have a workshop at the Conference on 8 May, organized by NAPLE in partnership with the Reading and Writing Foundation, around skills and lifelong learning in libraries. We’ll keep you updated as we define the contents of the meetings. Like other years we’ll publish through this blog all the presentations and documents generated during this 3 days. Last year, UNESCO launched their Medium-Term Strategy 2014-2021, setting the framework for UNESCO’s action in the areas of education, sciences, culture, communication and information for the next years. One of the key objectives of the Strategy is “Building inclusive Knowledge Societies through information and communication”. In this line of work, they launched last December 2014 the Open Access Curricula for Researchers and Librarians “a set of manuals to facilitate capacity building of library and information professionals and researchers”. Next April 16 the Library OnConference 2015 will be taking place. It’s the second edition of this Conference that uses the Google Hangout on Air (HOA) and, therefore, is strictly virtual: HOA allows you to “host and broadcast live discussions and performances”. All you need is a Google+ account and a Youtube channel. The OnConference is designed to be participative: there’s a keynote speaker that will open the session but, after that, participants will be gathered in different groups so they can discuss about different topics. Each group is moderated by an expert. The first Library OnConference was held last August 26, 2014. The keynote speaker was R. David Lankes, director of the Information Institute of Syracuse and author of “The Atlas of New Librarianship”. You can find his talk at the Lib OnCon Youtube channel. This year’s keynote has just been announced: Beck Tench, a North Carolina “simplifier, illustrator, storyteller, and technologist”. We find this an excellent example of how we can take advantage on the online free technologies to replicate virtually what we’ve always done physically, in this case connect, share ideas and discuss with our peers. The Bill & Melinda Gates Foundation commissioned Arabella Advisors to elaborate a report studying the leadership training programs for libraries. Through interviews with 26 library experts from 20 countries, they identified 30 programs through which only in 2014, 900 librarians were trained. The result is a report presented last January that “describes leadership-training opportunities that exist internationally for librarians and identifies competencies and skills that librarians learn in these programs”. As they say in the report, “tremendous potential exists in the library sector to meet community needs but that it can only be unlocked by effective and visionary leadership”. Marshall Breeding is a well-known independent consultant, editor of the Library Technology Guides, an expert in the links between libraries and technology. This white paper, that goes under the title of “The Future of Library Resource Discovery”, was presented last 23th February. The paper describes the State-of-the-Art of discovery services in libraries, giving a complete overview of the different tools and providers. It “addresses the broad topic of the methods and technologies available to libraries to make their resources discoverable and accessible by the communities that they serve”. It also describes the discovery services specifically in public libraries and points out the “opportunities for future enhancements in discovery services”. This study is freely available to download through this link. The Library of Congress Literacy Awards were created in 2013 “to support organizations working to alleviate the problems of illiteracy, both in the United States and worldwide”. They have 3 categories, 2 of which are open to organisations based outside the United States. The 2015 edition’s application phase is now open, until next 31th March. Harvard Library Innovation Lab is a project within the Harvard Law School Library for “exploring the future of libraries”. They are working in different projects that are shared freely with the community through their web. It can be really simple stuff, like the Hovermarks (http://hovermarks.org/), “bookmarks that face the spine instead of the cover” so they can highlight certain books or the Awesome Box (http://awesomebox.io/), a space that allows users to recommend materials. It can also be applications like the Library Stack , a browsing tool that combines the physical description of the materials with the circulation information to offer a different, more visual way to browse the collection or Perma, that “helps authors and journals create permanent archived citations in their published work”. These are just a few examples of what these people are doing, but there’s more, and there’ll be much more in the future so keep an eye on them, they look fun!